Some of you may be aware that I have been the victim of a recent smear campaign by another blogger. I have tried to ignore this but the manipulation of my writings and the outright lies told about me are simply unacceptable. Though I believe sometimes it is best to just ignore people who do these types of things, I also believe we have a right to stand up for ourselves when someone is not being completely honest about us. 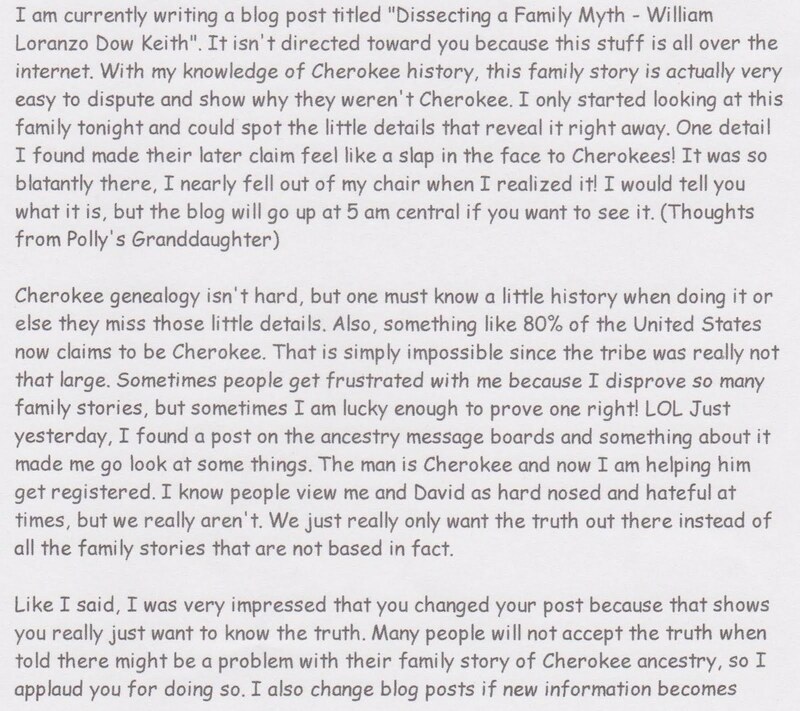 This all started over a request for help with Cherokee genealogy. I was simply trying to help someone I thought wanted to learn more, but apparently that was not the case. 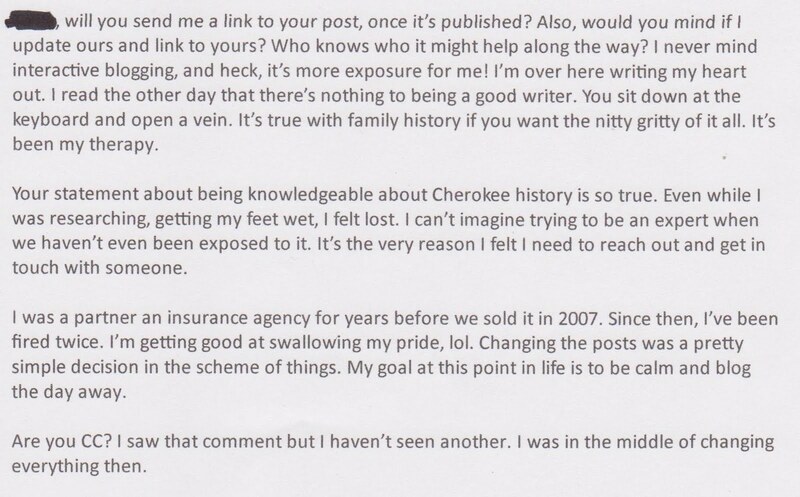 After one line in their ancestry was determined not to be Cherokee, they asked for another line to be reviewed, and then this led to another. I received 60 personal emails from this person in 6 days. On February 7, I received 22. I did say I would be willing to help this person in anyway I could, but such a large number of emails in one day was a little over the top. I might not have been upset had this person accepted my findings, but there was a constant rehashing of the same thing, over and over. When my conclusions stayed the same, I was suddenly portrayed as an "attacker" and many of my private communications became public and were used out of context in an effort to misrepresent what I had actually said. I believe this person was intentionally making an effort to harm my reputation and because they have refused to write an apology or retraction of their post, I feel I am left with no choice but to address the issue here. This is a very long post and it is full of actual copies of screen prints, emails, and other communications. (All names have been blacked out or removed because I will not post the real names of anyone on the internet without their permission.) I apologized in advance, but because I always believe in providing documentation for what I present as fact, I feel the need to do it now, just like I would in any of my other posts. In the blog, The Mashburn Collection, I was portrayed in a negative light in more than one blog post, but the one that is the most bothersome is titled, "Where's the Rain Dance When Things Need to Be Cooled." We are all free thinkers and I am not going to try to tell you what to believe or not to believe in this situation. You are free to read the communications and decide for yourself. This person was never referred to me, nor I her. She had contacted my very good friend, David Cornsilk, who had more pressing things to work on, so he then asked me if I would look something up for him. She never knew I was the person working on this until AFTER I emailed her. 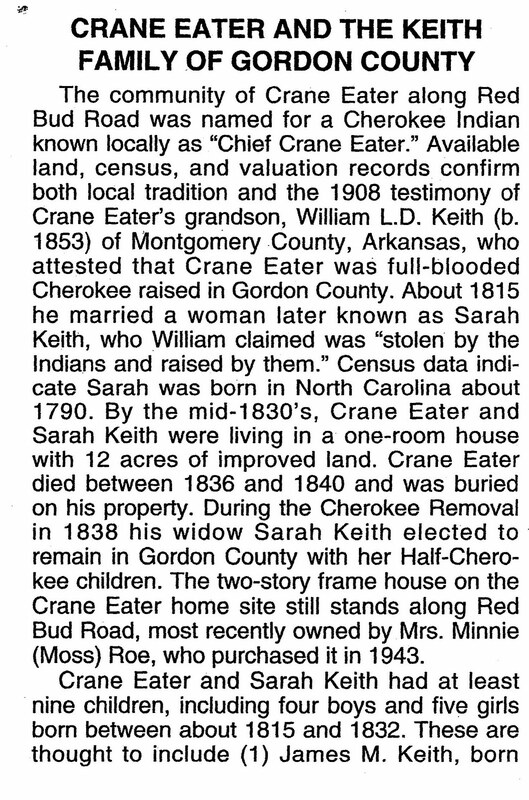 I love Cherokee research, so of course I was happy to look up this man. 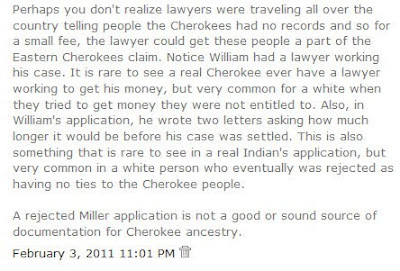 After doing my review of the Miller application, I thought I would do a quick Google search because you never know what you might find. That is when I found the blog, The Mashburn Collection, and saw the post about William Loranzo Dow Keith's Miller application posted there. I left a quick comment and went about my research. 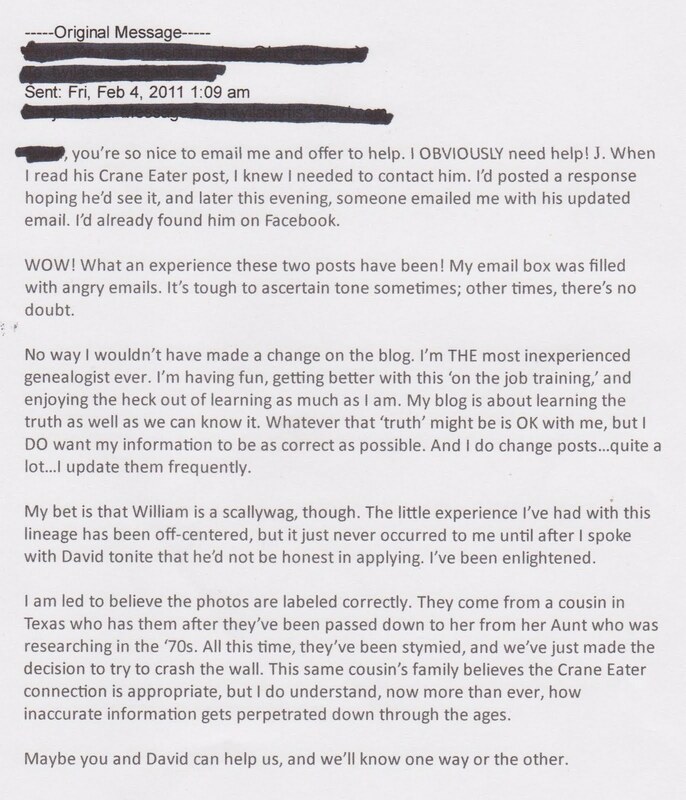 I sent David what I found and he later told me the woman the research was for was happy to have the accurate information and she probably would not be one of those people who keep perpetuating family myths. Later, I stopped back by to read the blog again and see if a reply had been posted to my comment and I saw the page had been updated and then I realized my research had been for the person who wrote the blog. 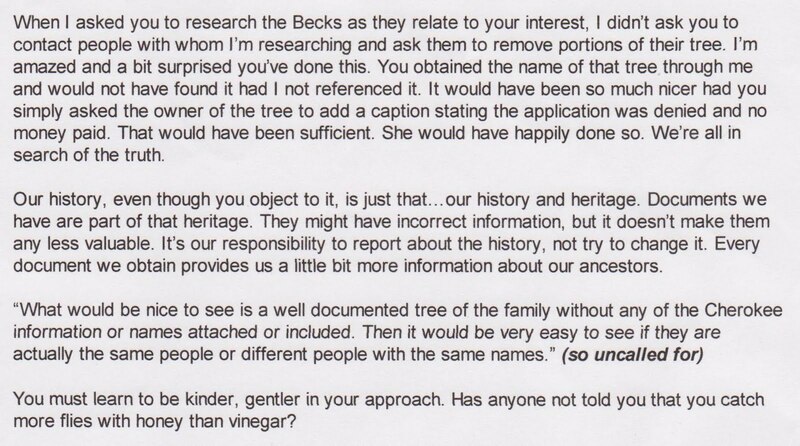 Excited that she seemed to be a genealogist only interested in the truth and not myth, I sent her a message through her "Contact Me" section. She soon replied with the following message. We continued to exchange emails and that is how this nightmare of an experience started for me. This is absolutely NOT true. The very night I started the research, I finished it, and I posted my findings to my blog. I never notified her of my findings because my research was not for her, but my own work that had started from a request for my friend. This was not paid research and I had no obligation to tell her anything about it, but I did thinking it might be helpful to her. 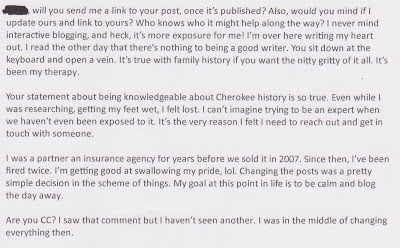 Though her writing makes it look like I was specifically doing research for her and she was not aware I would be posting my findings to my blog, I assure you, she was well aware that I would be posting my research. As shown in the emails below, she knew about it BEFORE I published it. When I finished the post, I notified her with a link. I even pointed out there was something a bit upsetting in what I found. I have NO idea where a comment like this would come from, but I NEVER said any thing even remotely close to this. I am appalled someone would suggest I would want them to cut their fingers off with a chainsaw and worse! It is absolutely uncalled for to make such accusations about me. Notice on this page, though, these additional comments are found that seem very contradictory to some comments found in the post that is most bothersome. I have no idea why I am accused of being "angrier". As you can see in the emails below, I was not angry, but instead just answered a question she had about the work in question. Once again, nothing angry about it. I just answered a question. And, per the message below, you can see my comment was misrepresented by only using a portion of it instead of it's entirety. I never mentioned the name of the person attacking me until the other person mentioned it first. This was in reference to this typewritten paper. 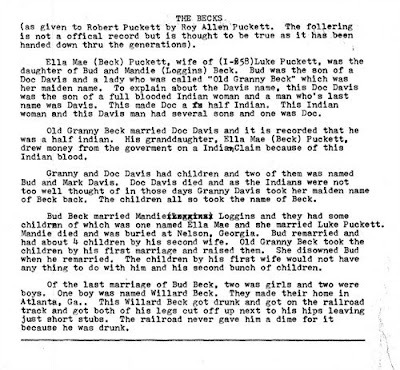 It is not an official document and certainly not a primary source. See paragraph three for the information I sent a correction about. Have you noticed a pattern here? This woman gets a lot of angry emails, doesn't she? 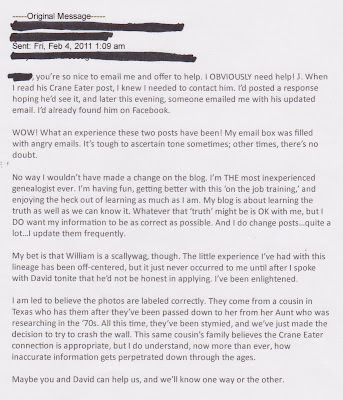 First, when she posted about Crane Eater, she tells me she received a lot of angry emails. I even told her I was sorry that happened to her. Now, she is claiming to have gotten angry emails from me. I would like to see these angry emails she was fielding for days. My reply - as you can see, is not just an angry email, but a response to a message she sent me but didn't let you know about. She is accusing me of doing things I did not do and then suggests I be kinder and gentler. Excuse me? 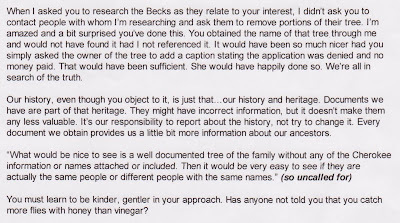 My comments about inaccurate information are in response to her stating, "Documents we have are part of that heritage. They might have incorrect information, but it doesn't make them any less valuable." Her family labeled by Guion Miller in a group as filing fraudulent applications was the Hillhouse family. Her Becks tie in with them and they were grouped together and rejected. And my response, is included in full in here. Notice she only used the part that served her purpose of making me "look angry." No, this was not what she did. She sent this email and then blocked me so I could not respond to it. I believe this is what she is referring to as "another angry post". Angry, no. Disappointed? Yes. Both David C. and I thought this person was not going to fall into the wannabe trap, but unfortunately we were wrong. I guess providing more information that her family was not Cherokee was viewed by her as "angry." I write about wannabes all the time. If I don't say the word "wannabe" at least once a day, anyone who knows me would think I was sick. Search my blog and see how many times the word "wannabe" comes up. It is a topic I write on a lot. Honestly, do people believe I have nothing better to do than sit around and write about them all day? Uh, yeah, whatever. I think the post she wrote shows she obviously has an agenda or she would not be repeatedly quoting me out of context and fabricating things that never happened. There are more emails. Like I said, she sent me 60 in 6 days. It would have been impossible to post them all here, but I did want to defend myself against her most harsh accusations. Nothing I have done is frightening, but her post about me is obviously lashing out. For what other reason would she post such misleading comments? This comment has absolutely nothing to do with anything that was discussed in her blog post. Having a step son who gets Indian blood through his biological mother has absolutely nothing to do with her or her ancestry. Talking about uncalled for comments. This is about one of the most insulting and stereotypical sentences I have seen in a long time. It absolutely has NO place in a discussion about Indians. 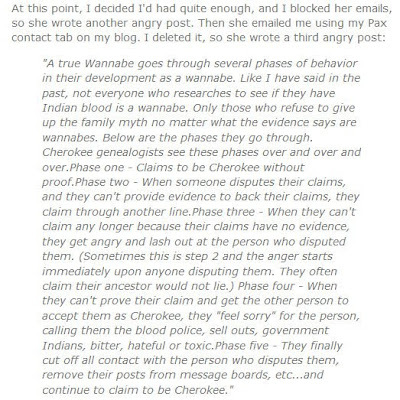 Once again, I am sorry this post is so long, but I think it is important for my readers to see the actual emails and other communications in this situation so they can see how wannabes attack real Indians when they don't get their way. It is quite shocking and unbelievable, isn't it? Honestly, after everything else she has done to me, I have to say it again. Why doesn't she just spit in my face? Update - The blogger who has launched this attack repeatedly changes her blog and all the posts. The above post I refer to has been changed numerous times. I did have the sense to make screen prints showing it as it stood at the time this blog post was published. 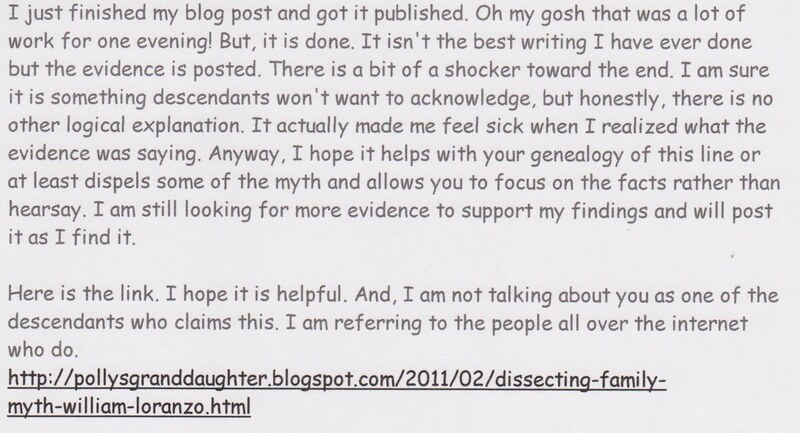 Should anyone doubt what is stated above, feel free to contact me for copies of her original blog post. Originally posted 15 Feb 2011. And we think this isn't a Wannabe attacking me? 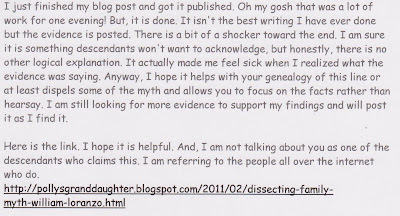 What self respecting, person seeking the truth would allow such a comment to be posted to their blog? It is obviously lies and something written by a mentally ill person, but that wannabe has such anger against me for telling the truth, she wants to try to make me look bad. Classy, isn't it? But, it does make for a good example of how wannabes attack. Wow she really tried to do a number on you. I don't really see how she can sit there and say lies and half truths, but i guess that's all a wannabe has. In her attempt to make you look bad it only makes her look bad. No sane person could ever stick around to see her everyday post of lies. I would be afraid to be associatied with such a person. What you need to do is start having people you do research for to sign a paper that states "they will not throw a fit if they find out they are not Cherokee". I am glad to be part of your blog site. I look forward to more of your blogs. This is such an interesting post! Thanks for sharing! 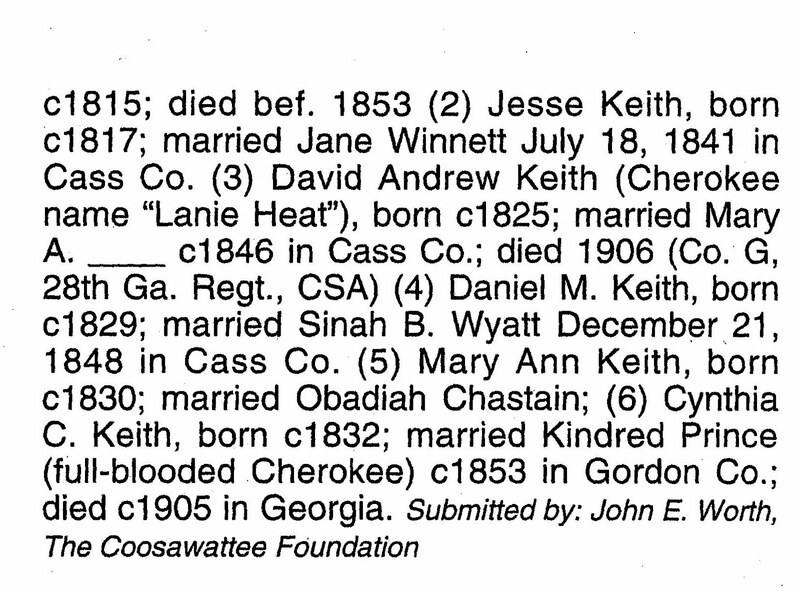 It is so obvious that the ancestor in question is NOT Cherokee. 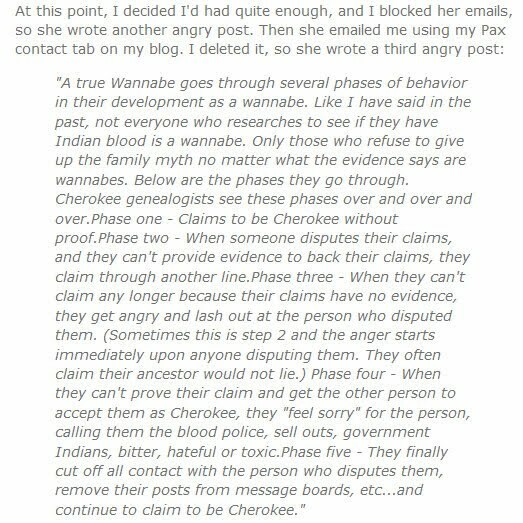 In true wannabe fashion the person kept persuing what was not there, Cherokee blood. 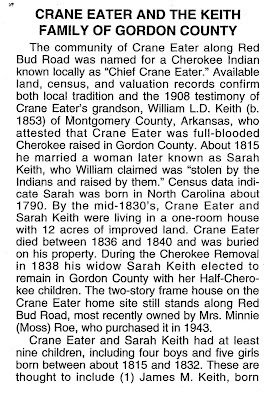 I can understand the person's frustration, probably had been told by relatives that there was Cherokee blood. 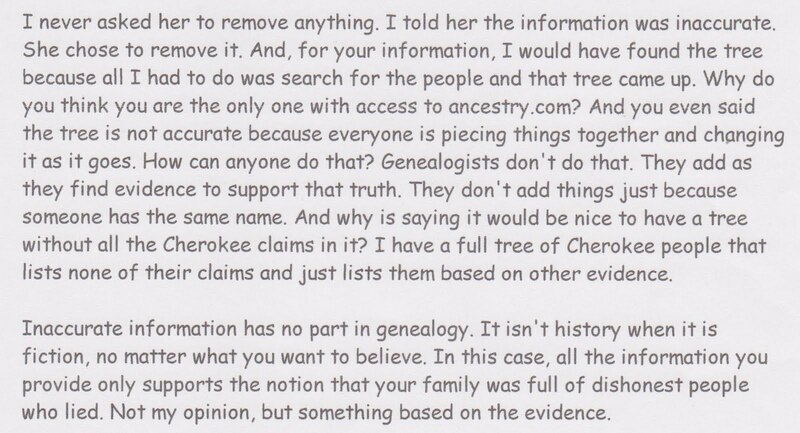 However, you presented undisputable proof and showed how her ancestor was not. This happens in genealogy. Family makes claims that are not true after researching them. She needs to accept this and move on to another research project. So a few years ago I began trying to pursue our so-called Cherokee roots. With no luck, however. 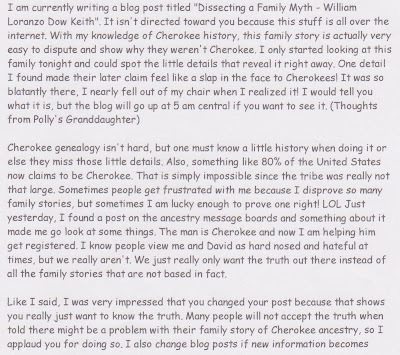 And the research I did began to point towards not having Cherokee roots. 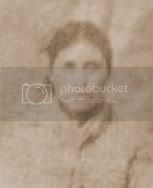 (the photographs of my aunt and her sisters with their high cheekbones, straight dark hair, and summer 'tans' point to having some Native American Ancestry, though) I have recently found a branch of family that did live in an area that the Cherokees lived in, so IF we are in any part Cherokee, that almost has to be the branch. 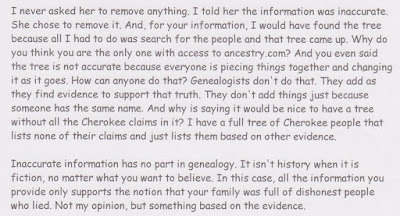 Otherwise, I must have an ancestor from a different tribe, and I'd just like to find out for sure. I have English, Swiss, Welsh, Scots-Irish, and more, and if there is Native American there as well, I would just like to know. Sherry, I have a post that describes what a wannabe is and is not. Anyone who is just looking to see, as you are, is not a wannabe. They are just someone who is trying to document their family history, whatever that may be. A wannabe on the other hand, is a person who just won't give up the family story, even when all evidence shows that story could not possibly be true. 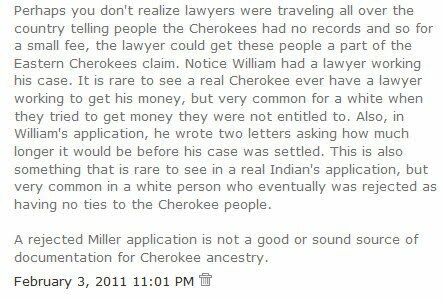 That is how the term "wannabe" came about.....a person "wants to be" Cherokee (or any other Indian) so bad, no matter what, they will claim it, even when the documentation says otherwise. I have ancestors that were called "Black Dutch". 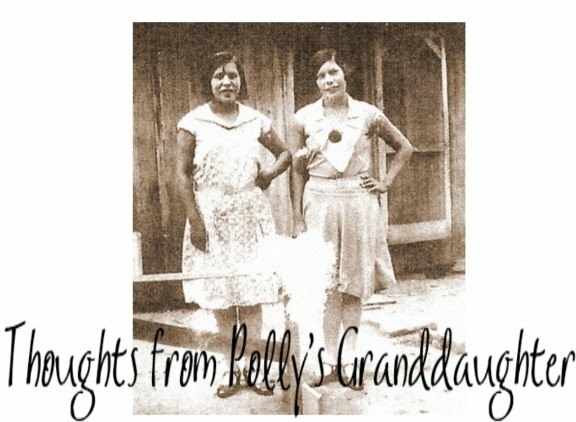 Is it possible that mixed bloods that descended from the fur trade actually did hide their ancestry to not be discriminated against? 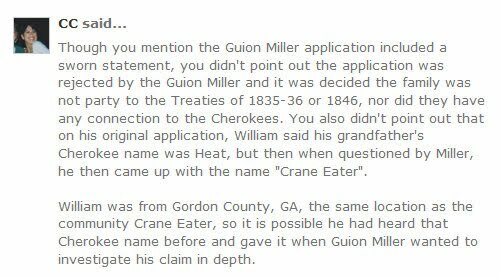 I have relatives that were denied any treaty rights because they were Cherokee slaves. They were "born into slavery". 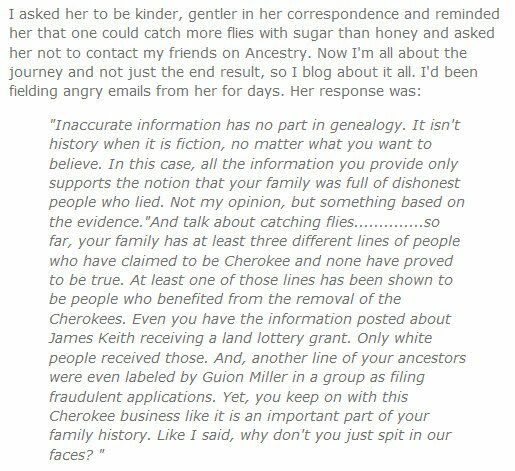 To get money from the "recognized" Cherokee Nations, you would certainly have to have relatives on the Indian census. 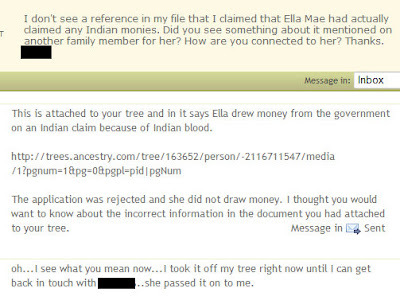 If your motive is to know and claim your ancestry does that matter? 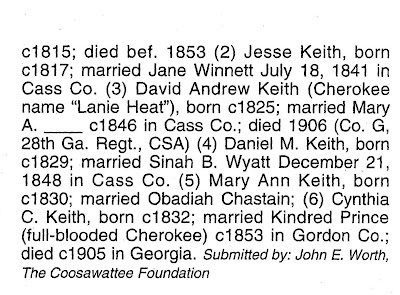 If an ancestor lived inside the Cherokee nation boundaries in 1750 could he possibly be at least part Cherokee? There are a lot of people that are part Indian that are not on your precious rolls. Its funny, there is always a claim of being half-caste gypsy, or native american or something or other. In russia its common that your "part jewish" but in fact you find out "jewish" means Han chinese, or mongol or anatolian or gokturk or all of the above. Slavs are very racist. People lie and I guess its cool now to claim to be indian. They have this amazing thing called an RDNA test.